*full disclosure: an online screener of this film was provided by the film's publicity arm. Writers: Ryûhei Kitamura, Joey O'Bryan. Cast: Kelly Connaire, Stephanie Pearson and Rod Hernandez. Japanese director Ryûhei Kitamura is known to this film fan for his work on The Midnight Meat Train (2008) and No One Lives (2012). Both of these earlier horror films are dark, gory spectacles. 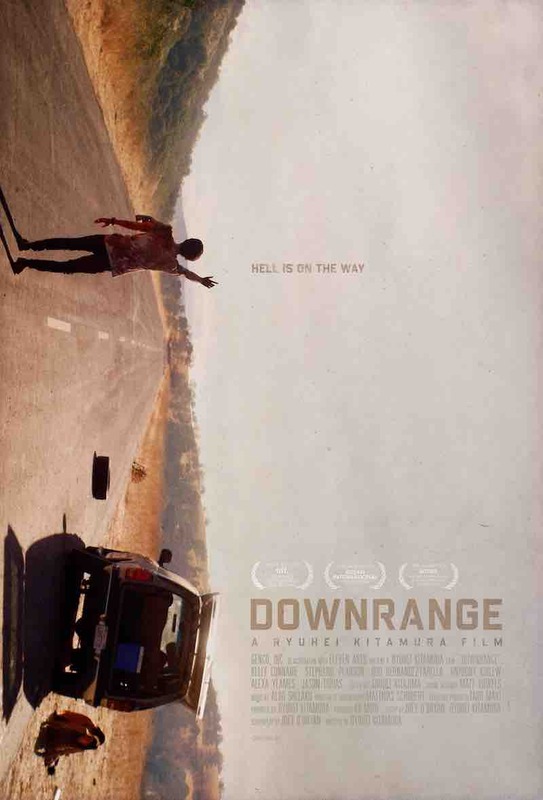 Kitamura continues his trend, to bring bloody scenarios to the screen, with Downrange. Six college students are trapped along the side of the road as a sniper takes aim at them. They are one bullet away from becoming roadkill. The film's plot is very bare bones; Downrange is more of a scenario, than a typical story. Downrange is also similar to other films, like Joel Schumacher's Phone Booth (2002) and Doug Liman's The Wall (2017). 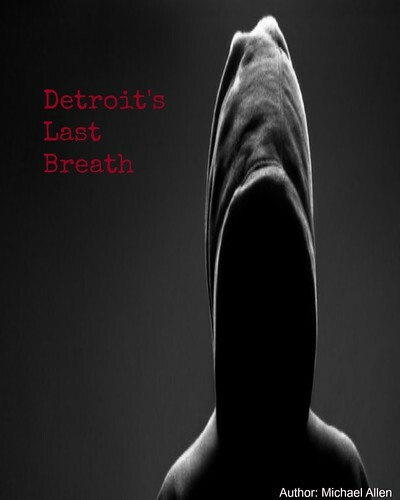 The focus is on the victim and their psychology as the villain remains anonymous. And, Downrange is really for fans of bloody spectacles, like gorehounds. There is more to like in Downrange, than to dislike and the film is consistently entertaining. The story has been stripped down, by writer Joey O'Bryan. Still, the plot focuses on six mostly acquaintances. Their destination is never really revealed. Though, one girl, Jodi (Kelly Connaire), needs to get to her sister's surprise birthday party. A punctured tire forces them to get to know each other, a little more. But, this is no ordinary flat. A sniper is taking potshots at them and their vehicle. Everyone takes cover for the next eighty minutes, or so. And, very little is revealed about the sniper, his motivations or if this is one of his regular past times. A memorial, by the side of the road, suggests this is not the first time he has stopped traffic. Blood covers everyone and everything in Downrange. The plot is really more of a scenario, than a story. Almost the entire film is shot through the victims' eyes. The killer is only shown in a few brief scenes (high up in a tree), later in the film. There is no real interaction between the rifleman and his prey. Everything is communicated through the end of a gun. So, the plot is really stuck in neutral, until the friends can finally confront the villain. Still, Kitamura introduces a few interesting developments. Another car enters the fray, to spectacular fashion. As well, the police eventually show up. But, all of these minor characters just increase the sniper's body count. Viewers should not expect a huge reveal, in the conclusion. This viewer was reminded of a few other titles, while watching Downrange. The film is similar to Schumacher's Phone Booth. In both films, protagonists are vulnerable. There is little way to protect oneself from a sniper bullet, especially when unprepared. Also, in both films characters are stuck in a setting or environment. There is nowhere to go, unless the shooter allows them to move. Liman's The Wall also keeps his killer offscreen, thereby increasing the tension through mystery. The mystery, within Downrange, is never broken. One character's identity is forever kept in shadows. Still, there is one central difference between these two earlier films and Downrange. In Phone Booth and The Wall, the killer talks with his victims and torments them through dialogue. That is not the case here. It is all mute silence within Downrange, between killer and soon-to-be-killed. Finally, Kitamura knows how to play to his fan base. Kitamura is known for his visual spectacle. He plays true to his strengths once again, by delivering gory goodness, here. The practical effects, by team lead Matthew Gabriel Wagner and makeup effects artist Jungeun Lee, are all believable and deeply disturbing. One character is nearly decapitated by a bullet. Others lose an eye or parts of their arm. Brain and blood matter cover the road. And, all of the visual muck is plentiful. Kitamura and his visual crew consistently deliver the bloody goods. Downrange focuses on the visual display and this will delight most horror fans, especially gorehounds. Downrange recently had its World Premiere at the Toronto International Film Festival. The film will continue its film festival rounds, throughout the year. A wider release is expected soon. Also, tThere are plans to release the film in Japan, already. Indie horror film fans will have to be patient, to see the film, unless they can find it at their local festival. As well, the film's plot also requires patience as it creeps along. In the meantime, a whole assortment of bloody scenarios will be put onscreen as the characters struggle to respond to the sniper bullets. A truly terrifying plot contrivance, Downrange focuses on the character's mental states unwinding, while keeping its villain hidden, both figuratively and metaphorically. The result is a tense, though slowly developed story of hunter versus prey. *it is strange to see the character Jodi, or Keren (Stephanie Pearson) with a sniper or hunter's scarf, in her kit. As well, the sniper never shoots at Jodi, even though he has the chance. Two more mysteries.